A watch upon the borders of Mordor in days of old, the tower of Cirith Ungol, the "Spider's Cleft", was a fortress constructed by Gondor after the end of the legendary War of the Last Alliance, in which Sauron the Dark Lord was originally overthrown and defeated. 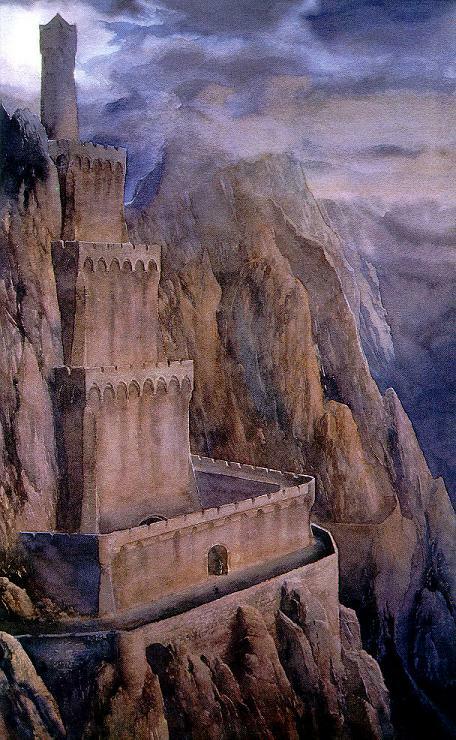 During the first half of the Third Age, while Gondor was strong, a garrison was kept at this Tower to ensure evil does not return. And for many centuries, the watch was kept without interruption. But disaster and misfortune befell the Kingdom and the garrison was called away to serve in its wars, until few remained. And when the watch was needed most, evil did return. And the tower of Cirith Ungol for a millennia became a fortress of evil. In the days of peace after the second fall of the Dark Lord, Cirith Ungol was reclaimed by the Reunited Kingdom. To serve as a border fortress, it was repaired and renewed to its original state and banners of the White Tree flew from its battlements once again. In His first days, King Elessar had given the lands around Lake Nurn to former slaves of Mordor and there was friendship between their realm and Gondor. But in the north, upon the plateau of Gorgoroth, the heartlands of the Black Land, evil still lurked in the hills and holes. From Cirith Ungol onto the ashes of this wasteland, companies of horsemen patrolled, taking a proactive stance to reduce the threat of these wayward beasts and orc tribes. Their efforts were not much, as the land was still a very evil place, tainted with fumes and fissures. Only the hardiest, volunteers from both Gondor and Rohan, dwelt there. Though the nights in Mordor often saw the gleam of stars, it possessed great evils in the very land which still irked upon the mind. Only those with a strength of heart and courage could sustain it. The only road inwards had to bypass the ruined city of Minas Ithil, a journey already full of frights and terrors. This fortress was the first and only line of defense between the former realm of Mordor and the peaceful regions of Gondor east of the River. Two companies of riders, one of Gondor and Rohan, were garrisoned there, along with a company of foot soldiers and archers and all the personnel to maintain their upkeep. But it was never enough to fully pacify the wastelands, for the attentions of Gondor and Rohan were often eastwards, beyond the Sea of Rhun, or in the south, in Harad. But the enemy never sought to attack the fortress. They may have ambushed a supply train or a few foragers in the hills, for Mordor blossomed with scrubs, mushrooms, and sickly grass in these later days, but they never attacked the fortress or the patrols directly, unless their numbers were great. There was no immediate danger, until one went far into the ashy heartlands eastwards. When the Darkness fell, the isolation was never felt more keenly than now. It happened very suddenly to the defenders of Cirith Ungol now. Before they had been able to project power all across Gorgoroth. Now they were trapped in a small pocket. Whoever had been outside of the walls when Darkness fell did not return. Orc tribes once disunified, more prone to fighting each other than the allied patrols, became very bold and threatening. In the first days, they enclosed the fortress and cut off all roads, before approaching the very walls itself. Never before had they engaged in any sort of siege warfare since the turn of the Age yet the defenders found themselves watching the construction of ladders and great shields. A centralizing power seemed to bind them but it was common for the orc chieftains to never cooperate with each other. It confused the defenders but there was little time to ponder. Every day since the Darkness, they had been assailed. Though the approaches were narrow, the orcs were consistent and determined. By the fourth day of siege, every arrow and projectile within the fort had been expended. Attrition whittled away the allied forces, until only a single half-company of riders remained, consisting of Rohirric and Dol Amroth knights. Supply was running out. Men feared orcs poisoning or fouling up the wells, the only source of water. When was help coming? Surely word must have gotten back to Minas Tirith by now. They had no sense of day or night. When the assaults ceased, a small party was sent out, to gather what they could in terms of projectiles and food. Even orc bread was becoming a necessity. But all knew that either help came or they would die, through eventual starvation or in battle. Achasson rubbed the corner of his eyes with his pointer and thumb as he sat discomforting on his horse. How long had they been sitting like this, formed up behind the gate? Matter of fact, how long had they been awake? The enemy gave them no reprieve and only a constant changing of the guard even allowed for some soldiers to catch some rest. For Achasson, on his feet, in many pounds of armour and gear, fighting all the while in the dry heat of this land, it must have been close to twenty hours at this point when he last got sleep. And only then it was a short brief, perhaps four or five. Sheer exhaustion was killing them worse than orc arrows. And why was the remaining twenty-six out of eighty riders formed up behind the gate? The supply party was out, searching the recent dead for whatever they could find. Arrows, food, unbroken swords and shields, water flasks, all of it. If the orcs attempted to assault, they would immediately retreat, blowing their horns as they fled back along the narrow path to the gate. Once there, the riders would issue out and frankly put, kill anything on either side of the fortress that wasn’t of humankind. A short sortie, from which they would immediately withdraw back into the fortress. The orc numbers were too great for them to take alone. The silence was heavy, especially in the perpetual dark. Fires burned low as they were almost out of oil and kindle for those. The horses shifted uneasily, grouped up as they were. Achasson and a few others were at the front. His stomach grumbled loudly and he reached into his saddle bag for a half-eaten biscuit of bread. Using his fingers, he broke off an edge and chewed softly. “Apologies.” He said to the warrior beside him, a shield maiden of Rohan. They said she was royalty and the men murmured about her. She was as stern and attractive as she was deadly. No one tried to court her yet, as if there was time. “Try not to mistake the rumbling of my stomach for an orc. Though, even steel sounds like a delicacy. Some jam and mushrooms, I’m sure it’ll be a feast to enjoy.” He jested with the woman, something to ease the tension as they waited for either a pitched battle or a safe return of the foragers. Éohild fought a yawn. She, as her companion, had been awake for nearly a day. Sat astride her own war horse for longer then either of them would like. She rolled her shoulders trying to loosen her stiff muscles. Her armor felt heavier then it had in a long time. And for the first time in a long time she was afraid, though she would never let the words pass her lips. Even the thought made her compress them into a tight line, as if the words might try to escape. Even for a young woman she had seen her fair share of battle. She had joined the men under her brother’s command when she was 17, though she had trained with them for much longer. It took time, but eventually she had earned the respect of the battle hardened men. In truth her parents had thought she would get a taste of battle, that she would see the harsh and bitter nature of it and realize it was no place for a woman. And she had seen that it could be harsh, and it was bitter to take a life. But the fight was also exhilarating, she was fighting to protect her people, to uphold her father’s laws, to protect her comrades in arms and herself. There was pride in that, and a feeling of purpose and accomplishment that she had never felt doing anything else. Now it had all come down to this fight. Her brother and his men, what was left of them, were trapped in this god forsaken keep, along with the brave warriors of Dol Amroth. Many of her friends had died, it left her morbidly wondering who was next. One by one they would fall if they didn’t get help quickly. The never ending darkness only fed the fear that none of them would leave the keep alive. Éohild was drawn out of her dark thoughts by her companion. The audible growl of his stomach reaching her ears. She keenly felt her own hunger. Despite her dour mood the Knight drew a smile, and a soft laugh. The light mood only lasted a moment. A slim hand reached out to run over her horses neck, the movement automatic. Her eyes took on a far away look for a moment. “Do you think the men got through?” She spoke of the men that had been sent to seek help from Gondor and Rohan. The thought makes my mouth water. Perhaps the attempt at humour, poor as it was, may not have been the best idea as it reminded Achasson of how dry his mouth actually was. He licked as best he could but it was like dragging his tongue over dryboard. The air in Mordor was still unclean, choked with dust and ash that settled on everything. He winced and hoped one of the scavengers sent out might come across fresh flagons of water, oily it might be. Beggars couldn’t be choosers. Éohild voiced the same thought aloud and Achasson could only peer at the dull gatehouse that loomed in the murk ahead. “There’s been no notice. Either they are still free from harm and are gathering or they all been taken out without a sound. Nothing to do but wait. I hate it too.” Achasson huffed, tightening his grip on his reins, causing his gauntlets to crunch. The waiting was sufferable, especially when it was known there were foes in the mist just beyond. A lot more than they had, certainly. He glanced up towards the walls, where if they peered hard enough, they might see the shapes of their own patrolling archers and watchers on the walls. They weren’t shouting or panicking yet, if they could see anything. Despite his impatience, he hoped there might be no trouble as well. Just one night, maybe a six hour stretch, of no fighting, no raiding, no scrambling to the walls or ducking and dodging shot projectiles. Just a couple of hours of peace and a chance to sleep. Wrong. He must have jinxed it. The sound of a horn came blowing rapidly in succession, three strong winds. The enemy was upon them! Every rider shot up straight and on the gatehouse above, men were scrambling to turn the machinery that would raise up the iron bars. “This is it, boys and girls!” The lead rider, a one-eyed Gondorrian knight of the Citadel. “Let our boys pass between us but stay rigid. We’ll charge the bastards and send them toppling down the heights. Steady now!” He told them, as the gates were raised and they began to surge out. Achasson loosened his sword in its scabbard but was primarily using the lance, which he leaned against his shoulder. He looked towards Éohild and tapped the cap of his winged helm. Good luck. They surged out, tight but loosening as they assembled on the roads. In the foggy murk, several figures were racing towards them, throwing up spouts of dust. It was hard to discern man from orc but as they neared, their emblems and gear became more familiar. The first passed through but those in the rear were hard pressed. “At em now, lads! Charge!” Their captain roared and altogether they surged down the path, Achasson feeling his heart surge with excitement with all the rush and thrill. He leveled his lance towards one foe in the distance, attacking a fellow of theirs. With a heavy skewer, he caught one orc in the side and painted his entire lance with blackish blood. It was a wild melee now. Dozens of orcs were following behind upon those besetting the scavengers. What was left of the mounted patrol clashed into them, stabbing, hacking, and hammering. While it should have provoked a riot, the orcs seemed content to throw themselves against this moving hammer of death and iron. They had the numbers. Attrition was on their side. Whittle down three or four riders every attack and soon there would be none left. But they had to fight on, until those on foot could get to safety. “Just one night…is that too much to ask?” Éohild muttered to herself, though her voice was loud enough for the men closest to her to hear, as a horn blew sounding the alarm. She was rarely one to complain, but she felt the situation justified it this once. They all needed rest. Not more loss of life. As was sure to happen. But she shook the thought away. It would do nothing but distract her. She couldn’t worry about which companions would come back through the gate when the skirmish was done. As they waited everything seemed to slow. She pulled her sword free of its scabbard, holding the reins of her horse in one hand, as the gate slowly lifted, its chains creaking. Éohild met Achasson’s eyes, raising her sword in her own silent bid of luck. All of them would need it. She closed her eyes, her lips moving in a silent prayer of protection for her comrades. And then everything snapped into play, in a rush of movement they were surging out of the gate to protect they incoming scavengers. There was nothing to focus on or think of but the battle at hand. It narrowed her focus, she was no longer tired and hungry. There was only one thing to do. Battle fever claimed her, the thrill of living only in the moment. Her sword moved as though it was apart of her, an extension of her arm. She sought out the enemy and struck, landing blow after blow on the foul beasts that meant to bring then down. It was a frenzied battle, she was almost pulled off her horse, only saved by the rider next to her as he plunged his own sword into the enemy, before he was speared through the throat. Red blood splattered her face and chest, mingling with the black blood of orcs. A moment of pure rage took over her as she pushed her horse forward, to hack down the orc responsible. The battle seemed to rage on endlessly, countless enemy were slain but there was always another to replace them. That wasn’t so for their side. Each loss would be felt keenly. A horn blasted in the distance, calling a retreat, but she barely heard it as she continued to rain down blow after blow on the foul things. It was only at the nudging of a fellow soldier that she began to back towards the gate. It had been a dangerous road from the confines of the mountains in the west to the lands of shadow in the east. To Ugath and the others of his pack, a half dozen or so orcs of various sizes and tribes, it was stark reminder of days of glory past now lost to them. It was a time of Big Bosses and orc-eating spiders and the endless wars with the thrice-accursed men from their rotten stone cities. A time when their dark master fed them human flesh and protected them from the fierce burning sunlight above. They hunted and roamed far in those days. Now the maggot-spawned races of Mordor had been reduced to warlike tribes, fighting each other as much as the men of Gondor who now occupied their lands. Those orc tribes far from here were all but abandoned and left to their own devices, to also fall into in-fighting and anarchy. No more. Their Master was back. Their true Master, their Creator in the depths of time unfathomable to Ugath or any of his party. They could feel Him now, in the darkening Void above, feeding them dark energies, embolden their spirits, feeding their lusts and desires. The promised Time of the Orc could still come to pass. The Sun had been shattered, a promise of their Dark Master’s strength and intentions to reclaim His rightful throne and authority over the world. The world of men will finally collapse. And one of their own shall help bring it to pass. For why else would an orc pack of the Misty Mountains venture so far east, risking discovery and battle with the strawheads of the horse lands and the bright eyed tarks of Gondor. Through the Dead City below they had passed, where no men or orc lived now and up the pass into the Spider’s Cleft, which they called Cirith Ungol. They knew the enemy had strongholds here but they saw their own folk also in number, prowling the lands about. They were not harassed despite the differences of their tribe and homes. They all worked in unison now it seemed as they had in Ages past. The orcs of the world were becoming united once more to pose a threat to the free folk in all lands. But the darkness concealed them and their prize, bringing the strange human witch many dozens of miles to the Shadow Lands. Ugath knew not why he had this intention but something outerworldly drove him to bring this woman to the east, along with her prize. He did not pry or question orders, even if the source was dubious. He had her now, seated upon his warg before him, his strong scaly arms about her to guard her himself. His pack was not as intelligent as others. They looked at her as flesh to be tortured, holes to be filled, meat to be consumed. They trudged behind him even now, bristling with iron spears, clubs, and short bows. Only fear of Ugath kept them in line and hopefully they feared him more than the enemy. They didn’t have to fight however, just bypass the fortress. It seemed their Dark Master stirred the others to assault its very bastion, the ring of steel and metal coming down to them in the haze and fog. “Try to flee and I’ll gut you myself.” Ugath whispered in the witch’s ear. He cared not if she worshipped his Master too. She was a filthy human whore and would serve only as long as she was useful. And that was to carry the artifact, which no orc dared to touch or even look upon. Unveiling its cruel light caused many of the weaker, smaller orcs to shriek and fall down on their faces. Only the mightiest could withstand its harsh and brutal brightness. “Stick together now. The filthy pinkskins control the narrow pass ahead but our lads should be holding them up.” He commanded but snorted to himself. He didn’t care if they were cut down. As long as he made it past with his prize, agile upon his warg, and into the vast wastelands of the east, all would be well. They would serve their Master’s purpose with their deaths. The fighting grew louder but they could see nothing. It was not known to Ugath that the pinkskins and their strawhead allies had rushed out of the fort to give battle. They came upon some corpses but ignored them. One of his own shrieked and threw his weapons aside, fleeing at the rumour of battle. Coward. The Master will torture him slowly no doubt for his abandoning but Ugath went on. The neigh of horses, cursing of orcs, shouting of men, it all became clearer. Yet they saw nothing in the haze. Not yet. But it came to them. In the shadows before them loomed a tall figure, seated upon a beast. It clinked with gear and harness and upon its head was a tall helm that shone brightly even in the fog, like two wings that flanked a pair of harsh eyes. It perceived them and onwards came a rush of hooves and eternal hatred for Ugath’s kind. He drew his scrimitar and bluntly thrust the human witch off his warg to allow him to fight. He would reclaim her later, once his pass was clear. All would die for the glory of his Master. The Recall was being sounded. Yet despite being perhaps two dozen feet from the gates, Achasson couldn’t even make out the battlements of the fort in the thick fog. Whence had this blasted haze come from? All he saw were more and more shadows of foes coming towards him. He had to make it back but his horse whined and would not listen. Something fouler than orcs was coming and he heard it, growling and snarling. A warg. His horse, wide eyed and terrified, tried to pull back, causing Achasson to curse. The warg barked and came forth, a hideous orc upon its back. Achasson did not wait for its attack. Reeling back, he flung his lance with all his might and clean through skewered the rider. Out came his sword in a ring of steel and with a shout, stabbed into the gaping mouth of the warg as it leapt to him. Straight through its skull he clove, through its momentum struck him still and knocked him off his horse. It bolted, whining at the foul blood and fled back to the fortress on its own. Éohild and others would know it was his horse and it was obvious he was either dead or unhorsed. Could they risk going back for him? Perhaps he was already marked to be a dead man. Alone in the fog he stood and heard the onrush of orcs. His shield he readied and his sword twirled in his hand. If death was coming, he would meet it with a roar of defiance, for the glory of Gondor and the memory of Numenor. “Gondor!” He shouted in a war cry, meeting the first orc of Ugath’s pack and cutting him down in a handful of strokes. The second he smote with his shield but the third cut him with a blunt blow to his shoulder, knocking him down to one knee. He raised his shield above his head, immediately set upon by a trio of orcs, hammering his defences. A cold iron spike found a chink in his armour, drawing blood and lancing pain through his body. He snarled and cursed, stabbing one orc, perhaps dishonourably, in the groin. If he did not get help, he would soon he slain by sheer numbers! Lôminzil was exhausted, she dozed as best she could cradled as she was between the massive arms of her orc guard/protector. She hated the beast but knew he was likely all that kept her from the other orcs' cook pot. This was not at all what she had expected of the prophecy for which she had been prepared for what seemed like her entire existence. It had been a privileged life, a comfortable life and she missed it. Truth be told she had always thought she would live out her years preparing for a prophesy that would never come to pass, just as her mother, her mother's mother, and her mother before her had done. It had all been so easy, physically at least even if the studies could be quite demanding. But this? This was hell. She missed the sun, the light, the warmth. Yes she could feel the seduction of the dark lords power, craved it even, but at what cost? Despite her exhaustion she felt it might be better to walk than to continue riding this infernal creature. She was beginning to understand why the orcs wouldn't listen about finding the other shards. The end game was easier for the creatures of darkness than for the world of men and light. The orcs need only keep one shard from falling into the hands of men and already they had one, the very one held by the dark witch. She had become little more than a captive, a beast of burden though the burden was a single shard of the sun, the hope of men but the bane of orcs. They were frightened of it, hated it, for that they kept her alive and relatively unmolested. What had she done? She asked herself, faced with an eternal darkness, and no hope of the sun ever rising again. Though she had never been here before, she knew the lay of the land well enough from studying maps to know they were nearing the point of no return. Beyond a small outpost, all but overrun, there were only orcs or worse ahead of her. The shard she carried was about to be taken beyond the reach of free men. Though she had never seen the grandeur of Gondor, she had seen pictures and heard stories of her distant kinsmen. As she saw the bright helm through the fog she thought perhaps she was dreaming, it seemed all the more a dream as she was suddenly falling. But as she hit the ground she realized it was not a dream at all. She watched with curious detachment as her protector was skewered by a lance. She had thought that orc nigh indestructible but she watched as he fell to the ground spouting dark blood. She feared the other orcs would pounce upon her but they went for the rider, now unhorsed. She watched with horror, having seen the fate of the few hapless men the rampaging orcs had consumed on their march. But this was no defenseless farmer, she watched another orc fall, this one could fight back. But there were just too many orcs, it was hopeless, just one more man falling into the black abyss of eternal night. It was then she realized that this was her very last chance. Still laying where she had fallen she searched in the dark for her pack. Fearing it was already too late she fumbled with the covering, as if in a dream she simply couldn't move fast enough. But finally she held it aloft and pulled the special cloth off of it. It shone as the sun, of which it was a mere fragment, but in this small pass it filled the dark with light, burning the haze of fog as the orcs shielded their eyes and cursed the light. It wouldn't hold them for long, they were after all Urak-Hai, they would regroup and come for her, unless there was other hope in this pass.